If you hav e your home on the market right now, you may be wondering what you should do about decorating your home for the holidays. In my experience, a modestly-decorated home feels fresh and cozy, so don’t be afraid to break out the garland and garnish! 1. Avoid adding clutter. 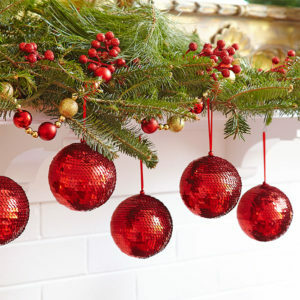 Your home may be staged and de-cluttered before introducing holiday décor, so don’t just add décor without removing some of the items already in the room. As you are adding décor items to a room, keep focal points in mind. If you add a focal point with décor, make sure you remove something that was already a focal point. 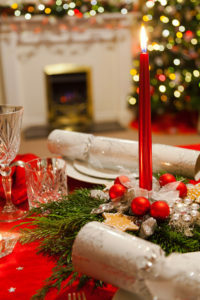 For example, if you have a dining room table scape with a runner, two candlesticks and a centerpiece, don’t just add a poinsettia to the table without removing the other centerpiece. 2. 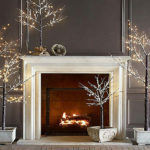 Consider a smaller tree if a larger one will make a room feel cramped. Since a seven foot tall tree can take up 20 square feet at the base or more depending on the type of tree, you may be better off either opting for a tree with a thinner base or a shorter tree put on a small coffee table or sofa table-height table. 3. If you put holiday lights on your house, make sure they are the same type and color. If they twinkle, make sure it is in a harmonious way. Having whole sections of your house blinking on or off at once while other sections are marching to the beat of their own drummer can be distracting to potential home buyers. You want the whole house to be what the buyer is focusing on, not the lighting show. 4. If baking is part of your holiday traditions, by all means, put on the oven mitts. It goes without saying that you should do a good job of cleaning up afterwards. I also suggest having a good storage plan in mind if you usually stage extra goodies on the counters. Find additional storage in the cabinets or pantry for those holiday treats to avoid clutter. 5. Beware of lit candles. If you have a last-minute showing and need to leave the house in a hurry, be prepared to blow out all the candles before you do. I recommend having someone in charge of this activity and having a reminder by the door to check all candles before walking out.